The Smart Parking Assist System checks the front and rear space to exit the vehicle from the parking space. 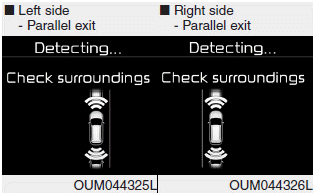 When checking surroundings, if the front or rear vehicle (or object) is too near, the system may not work properly. When exiting the parking space if an obstacle is detected that may cause an accident, the system may cancel. If the space is too small to exit the system may cancel. If searching surroundings is completed, continue using the system after checking the surrounding area. The Exit mode may be activated unintentionally, when the shift lever is in P (Park) or N (Neutral) if the Smart parking assist system button is pressed.